An enjoyable, light-hearted movie that often feels like something we’ve seen before with its single father issues and dealings with his kids. We Bought A Zoo is a movie that takes a familiar situation and implants it into a completely fresh and creative environment. Unfortunately, the results are still exactly the same. The situation is the single dad trying to raise two kids. Most of his conflict comes with his son, who has a lot of anger. now we’ve seen movies like this before, from ordinary people to Mrs. Doubtfire (bet you never thought you’d see those two movies lumped together). Even The Descendants, with Matt Damon’s buddy George Clooney, was about a single dad trying to raise two kids after his wife’s sudden and unexpected exit. 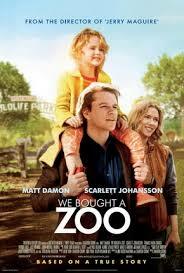 there’s nothing new about the situation, and We Bought a Zoo knows this. so it takes it’s storyline and uproots it from the usual setting, and then moves it to a zoo. the zoo material is the reason why this movie has legs. it’s the one thing about this movie that feels original, and it goes a long way. only we don’t exactly learn anything about the animals. we don’t have any close, life threatening situations, or any serious accidents, like what would really happen in a story like this. the boy accidentally lets a bunch of Poisonous snakes out and nobody gets hurt. a bear somehow escapes and gets onto the neighborhood streets, and nobody gets hurt. oh, and a lion has his cage door broken and approaches the guy who goes in the cage to fix it from the inside…and nobody gets hurt. maybe that’s because the movie isn’t about that. the zoo environment is really just a disguise. it’s the outfit that the movie is wearing, but it’s not what the movie is about. the movie is about this single dad and his two kids. the dad is Benjamin Mee (Matt Damon), a likable enough guy. I like the opening montage with Mee’s son, Dylan, doing a voice over about his dad. Benjamin loves adventures. he is the perfect guy to take on this massive undertaking that the movie is all about. Also at the start of the movie, we learn that Mee’s wife has just passed away and that Mee doesn’t really know how to live his life without her. he’s got these two kids and a brother who supports him (played by the always wonderful Thomas Haden Church), but he just doesn’t know what to do with himself. for example, he seems to be avoiding all of the places that he used to go to with his wife. his brother gives him an interesting talking to about that one. Also early on, Mee realizes that they need to move. there’s a loud party in the house next door, and his little daughter (who is cute as a button), can’t sleep. now, on the one hand, it’s just one party. and are we really to believe that Mee never noticed this was a problem before, when his wife was still alive? but on the other hand, the move is probably not because of the noise at all. it’s probably because Mee can’t live in the same place anymore that he used to live with his wife. the house just reminds him too much of her and of the times they had together. and that brings him to the zoo. the guy who plays Leon on Curb Your Enthusiasm is the realtor who shows Mee and his daughter around, and this guy is funny as usual. in what great moment, he tells the little girl that he loves her mom, even though he never met her before. and he leads Mee and his daughter to the zoo, without telling them what the place is exactly. Mee accepts the deal and buys the house despite the condition that he must now own and operate this zoo as well. he accepts it because his daughter seems happy there. but what about his son? apparently, the Poor kid loses all of his friends who never come to visit him once they move away. we learn that at the end, and it’s kind of upsetting. luckily the movie doesn’t dwell on it. 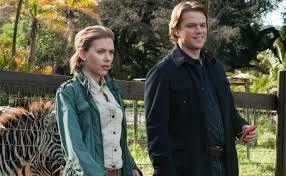 instead, it is busy having silly little adventures with scarlet Johansson as the head zookeeper. Johansson is a little young to be in charge of the animal duties with this place, but so what? the movie does justify it a little by explaining that this is her life and that she has devoted herself to it while her friends and other people her age are going out to clubs and having fun every night. the real reason Johansson is here is for the romance between she and Damon, of course, but cleverly the movie doesn’t do much with that and really only brings it to our attention in the later Portions of the film. the best things in this movie are the conflict scenes between Mee and his son. the animal scenes are all goofball throw away stuff. especially when an evil inspector, played by john Michael Higgins, comes to town. I suppose there needed to be an enemy or an antagonist somewhere in the mix, but it does feel very clichéd. and when the little girl tells the inspector off, it’s just silly. but the son stuff is great, and I wish this movie had more of it. there are many problems with we bought a zoo. a lot of them have to do with believability. the school, for example, that is so upset about the son’s painting with a severed head and blood on it, probably wouldn’t be hanging that painting up high in the hallway for all to see. just an example. but despite it’s problems, this is still an enjoyable movie. it is a Cameron Crowe film, and he’s a very talented filmmaker. especially when it comes to knowing how to get at the audiences emotions. Crowe is the mastermind behind say anything, jerry McGuire, almost famous, and vanilla sky. his best movies might all be behind him, but he’s still got some talent. we bought a zoo is not a great film, but it’s still kind of fun at times and somewhat worthwhile.